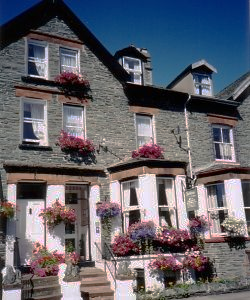 Lindisfarne House is a Victorian Guest House situated close to Keswick town centre but in a quiet location and central to the lakes, parks and theatre. We pride ourselves on our locally sourced produce and cater for special clients. We have en-suite facilities and all rooms have digital TVs, beverage trays, hairdryers and alarm clocks. Walkers and C2C cyclists welcome, we also have drying facilities for the occasional wet days. Access statement: Access to the property is by five steps up to the front door, our rooms are spread over three floors (each flight having nine steps up) and our dining room is in the basement (12 steps down). Our doorways are 34" side, bathrooms and toilet facilities are situated on the half landing and are unsuitable for wheelchair access. We do not have safety gates or other facilities for children.